Artist's depiction of Space Adventures' circumlunar flight. Fifty years after the first American astronaut rocketed into space, one commercial spaceflight company is hoping to push the envelope even further, with tourist trips around the moon. And now they plan to use a bigger spaceship. The Virginia-based space tourism firm Space Adventures has brokered commercial rides to the International Space Station for the last 10 years under a partnership with Russia's Federal Space Agency, which provided the Soyuz spacecraft for the flights. The three-person Soyuz vehicle also forms the core of Space Adventures' trip for two around the moon at $150 million per passenger, but the U.S. company today (May 5) announced a new twist: an extra module to give customers more room during the lunar visit. "The mission, in my mind, will be another watershed event," Anderson said in a news briefing today. "It's remarkable that a private company will be able to work in the market and finance what is likely to be humanity's first return to the moon in what will, at that time, be 45 years." The circumlunar trip will first take customers aboard a three-seat Soyuz to the International Space Station, Anderson said. Two seats in the capsule will be occupied by private customers, and the third will be reserved for a Russian mission commander. The passengers will spend 10 days visiting the space station, during which time a separate rocket with an upper stage engine and additional habitation module will be launched into low-Earth orbit. This newly announced habitation module will almost double the room in the Soyuz, adding substantial volume to the otherwise cramped quarters of the Russian capsule, Space Adventures officials said. The vehicle used for Space Adventures' circumlunar mission includes a Russian Soyuz spacecraft with an extra habitation module and upper stage engine. To complete the next phase of the trip, the Soyuz would undock from the station and rendezvous with the separate booster and module in orbit. 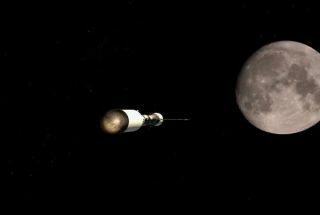 The upper stage engine would then fire, sending the passengers on a 3 1/2-day voyage toward the moon. The price for Space Adventures' maiden journey to the moon is not set, but will likely cost each passenger between $120 million and $150 million, Anderson said. This figure depends on a number of factors that will be negotiated with the company's Russian and space station partners. The voyage will also require at least two months of training to help familiarize the customers with their vehicle and microgravity environment. Dennis Tito, a California-based multimillionaire, became the first-ever space tourist when he launched to the station in a Soyuz capsule on April 28, 2001. His groundbreaking trip ushered in a new era of private spaceflight and opened the market for private investment in such enterprises. Now, Space Adventures is hoping to continue that legacy with its first circumlunar flight. "The moon holds a special place in all of our hearts," Anderson said. "It's a symbol of the space future that humanity wishes for, a symbol of our curiosity, and something that we see every night. When the private moon mission launches, the eyes of the world will truly be upon those people, and it will truly be an extraordinary event."